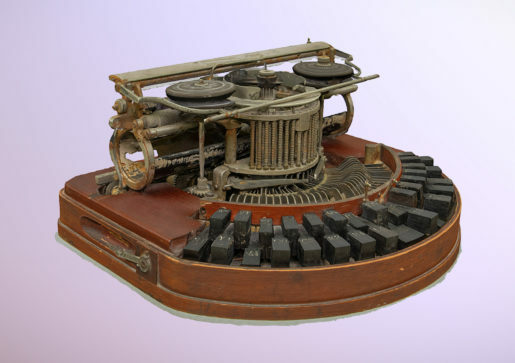 Here you see a 3-D image of a Hammond 1 typewriter manufactured in 1894. You can use your mouse to manipulate it so that you can see the machine from different angles and zoom in and out. Thank you to Shachar “Vice” Weis, President and VR/AR Designer at Packet39, who has created 3-D renderings of five Museum London artifacts. All of these artifacts will be included in Museum London’s upcoming new permanent history exhibition entitled London: A History. And now back to the Hammond I typewriter. American James Bartlett Hammond (1839-1913) introduced it in 1884 to widespread popularity. Let’s look at some of its features. Rotate this 3-D image so that you’re looking at the machine from the side. Do you see the lever and the concave disc attachment at the back? When the operator pressed a key on the keyboard, the lever moved the concave disc forward. This action pushed the paper against the ribbon and the type-shuttle bearing the desired character. This created the imprint on the paper. In other machines, a hammer bearing the desired character struck the ribbon against the paper to leave an imprint. Rotate the image again so that you’re looking down at the typewriter from above and you can see a feature that operators appreciated. They could swap out the type-shuttle, the curved piece of metal with “spokes” inside the central disc, and so change one typeface for another. Since you’re looking down at the machine, check out its two-row keyboard. When Hammond manufactured this machine, the company produced both this “Ideal” keyboard and the QWERTY one we’re familiar with today. Manufacturers only standardized keyboards in the early 20th century when it no longer made financial sense to offer purchasers a choice of keyboard. Until that time, each purchaser selected the keyboard that best suited them. Records tell us that London’s William C. Coo chose this model in 1894. It became the first typewriter anyone used in the London Public Library. But there’s a puzzle here: Coo didn’t work for the library. The 1894 London City Directory tells us that he was the official court stenographer as well as the Principal of the Western Ontario Shorthand Academy and Business College. Perhaps, then, he selected the machine for library staff to use? And perhaps he trained staff in its use at his school? We may never know for certain. Women’s inborn docility meant they tolerated boring and repetitive work better than men. Offices would not see another such monumental change until the introduction of personal computers in the 1980s.